Day 2 in DC, I ventured back up to Dupont. Boring, I know. How many neighborhoods are there in this town? How many great restaurants? But I found myself walking, and where I found myself walking to was Kramerbooks and Afterwords. Starting at the name, it's a clever place. In front, on Connecticut Ave, is a double store front stuffed full of good books. In back is a cafe with a bar and a outdoor patio, stuffed full of locals in cozy conversation over pie. The bookstore is heavy on the political and travel, and steadfastly literary. It's a relatively small space, and you get the sense that every book here counts, that it was selected for a reason. Even in fiction, its got a lot of award winners, and not much fluff. The effect is that every book on the shelf feels a little like it was recommended by a friend. I happily found the main bit of fluff in current rotation - Boomsday - and enjoyed getting avocado on it at the Cafe. Afterwords, the cafe, follows sort of the same theory. It's delicious food, carefully selected and meticulously prepared. I ordered a crab cake and avocado salad. The crab cake was substantial and well seasoned, the avocado tender, and the assemblage was beautifully presented. OK, maybe rectangle plates have gotten a little cliched, but I still love them. 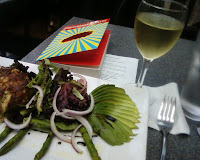 The smoothness of the avocado mixed well with the rough mix of the crab cake, which blended well with the sweet bite of the balsamic, which offset the slight bitterness of the asparagus. Altogether simple food, well conceived. And. This place is full of ands. 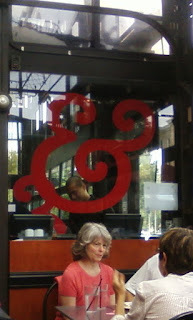 The Logo is an ampersand (in Linotype American Typewriter Alternate for those keeping score at home). And Dessert: one giant slice apple pie with vanilla ice cream. I had great expectations - fond memories of desserts here, and a case of pies and cakes facing the bookstore that makes you feel the sweet surprise of spotting a $100 bill on the sidewalk. Against those expectations, the pie was pretty good, but not great. It was a little too sweet, a little too crumbly, a few too many drizzles of sauce over the ice cream, a little too ambitious. This was particularly surprising given the restraint of the salad. Not that it slowed me down much - and I scooped up the last of the ice cream just wrapping up the second chapter of Boomsday. And I was very happy.